Paul Morgan Architects Cape Schanck House located near rugged coastline, in native trees subject to strong winds. The shell of the house was designed through modelling of site sun and winds, while an internal tank cools ambient air during summer, collects and stores rainwater, and supports the roof. Located near rugged coastline, Cape Schanck House sits within an expanse of native trees subject to strong prevailing winds. Located near rugged coastline, Cape Schanck House sits within an expanse of native trees subject to strong prevailing winds. This tree growth has a distinctive pattern, a result of light stimulus, or phototropism, which causes the trees to form a natural ‘tunnel’ at the west of the site. We developed the shell of the house through the analysis and modelling of onsite sunlight movement and wind frequency, speed and direction. This produced an aerodynamic external skin and continuous internal skin. The underskin flows continuously from the external eaves to the ceiling, where it gathers to form a bulbous water tank. The tank cools the ambient air temperature during summer, collects and stores rainwater, and structurally carries the roof load. This tank also plays an important role in organising the living area into four discrete zones: kitchen, living, eating and work. It is the locus of the house, a sort of ‘mandala’, displacing the fireplace and hearth from a position of centrality to a secondary role. 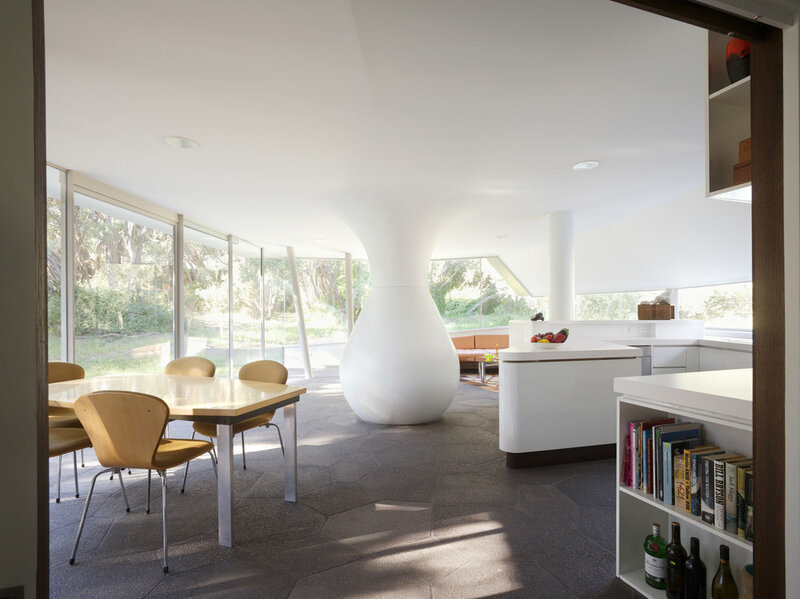 In Cape Schanck House, the technological (large spans, transparent walls) is synthesised with the natural (rock-like pavers, leather and timber panelling).